Alrighty! Here we go. Two books by Canadian authors read over the course of the last month or so, and I'm here to talk briefly about them. These aren't proper "reviews," but rather thoughts on the two books as I explore the literature of Canada. 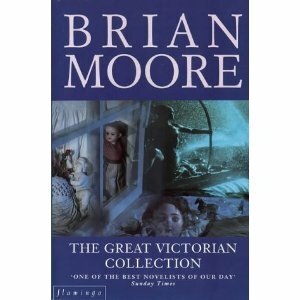 I've previously read at least one book by Moore. I just can't remember which. Obviously, it made a very big impression on me. After reading his bio on Wikipedia, I see the man was actually born in Belfast, Northern Ireland. But he's listed as both Irish and Canadian. Well, alright. 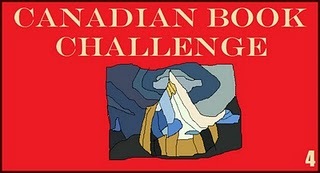 This book won the Governor General's Award for Fiction in 1975, which is a Canadian award. Methinks he counts for the Challenge. Plot synopsis: History professor Anthony Maloney (Tony Maloney. Cringe.) is in Carmel, California, to attend a seminar at Berkeley. His first night there, spent at a small motel, he dreams a mysterious man takes him on a tour of priceless Victorian curiosities. When he awakes, the curiosities are set up in the motel's parking lot, conjured out of thin air. He's thrilled. Beyond thrilled. Victorian history is his specialty, and here he finds booth after booth chock full of antiquities, all in perfect condition. Explaining what happened is of course a difficulty, but after enough convincing – and the authentication of Victorian specialists – at least some are won over by his story. Soon he discovers some of his actions have an impact on the collection, and I won't tell what or how, because this makes up a large part of the rest of the book. Theme: A variation on the "be careful what you wish for" theme. My thoughts: Well, it started out great. I love magical realism, books brushing up against the supernatural (used sparingly and with elegant understatement). But it didn't take long until it became a chore. Joe: "Hello, Bob," said Joe. Bob: "Hello Joe, said Bob. Joe: "Hey, Bob, would you like to go out and have coffee?" Bob: "Yes, Joe, I would." Joe: "Well, Bob, I know a great little restaurant." Bob: "Okay, Joe. Let's go." Most of this book was written in this sophomoric style. In 1975 the pickings for the GG Award must have been awfully slim if this book won. And I think I just figured out why I can't recall which other book of Moore's I read previously. I've blocked it out for self-preservation. On the other hand! Miriam Toews. I think I'm in love. Plot synopsis: Min Troutman, deeply depressed mother of two children – Logan and Theodora (Thebes) – is hospitalized for the umpteenth time when she becomes suicidal. Her sister, Hattie, flies home to Canada from Paris and assumes guardianship of her nephew and niece. Deciding their biological father, whom Min kicked out many years ago, would be a better guardian for them, she gathers the kids up and embarks on a road trip to find him. The only problem, he's been gone so long she's not sure where he is. But she does have his last known location, Murdo, South Dakota. The trip is one wild, hilarious romp through the United States. The kids are delightfully quirky, much like the characters in 'Little Miss Sunshine' (another road trip tale). You'll know what I mean if you've seen it. My thoughts: The writing is an absolute joy. In contrast to Moore, Toews' prose sings, and her dialogue is natural and enjoyable, without once giving me the dry heaves. It was panned by some critics, but maybe they just don't share my sense of humor. And, yeah, okay. A lot of strays from probability. But it's so wacked-out I forgive it. And that's it for books one and two. 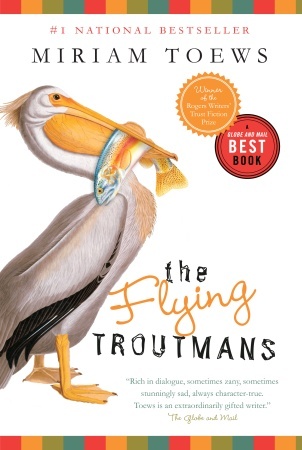 I also thought of Little Miss Sunshine when I read The Flying Troutmans! Next Post Life is chill, dudes.